In the dark I struggle with my phone, infernal gadget, to try to make it stop beeping and blinging. Bewildered, I stand there trying to remember why I have made myself wake so early. What do I have against myself anyway? Then I hear the children moving in the kitchen and I remember that it is Anzac Day. I make the coffee and pull on my shoes and stumble out on to the street. Our friends have arrived. We go down to the corner near the train station and follow the crowds streaming from every direction into the park. We are early, well before dawn, but thousands have already filled the park before us. The ground is still muddy from all the rain this week. When the service starts we cannot hear anything, we cannot see what is going on, so we slosh through the mud to find a better spot. We still cannot see anything but now we can hear what they are saying. The Anglican minister is talking about one of the boys from our neighbourhood who enlisted and went to Gallipoli and disappeared there a hundred years ago. Then his brother enlisted and went to Gallipoli to try to find him, and he died there too. Now we are singing a hymn and somebody reads a poem and the bugler plays the Last Post. He plays it well, very sad and slow. Soldiers and school children and old ladies come down and lay wreaths around the war memorial in the middle of the park. Some of them cannot get through the crowd to lay their wreaths. Afterwards we press through the crush of people, our neighbours, to see the wreath that my daughter helped to make. She spent a whole day and then another day making red poppies with her knitting needles and a lot of red wool. We tell her that it is the finest of all the wreaths, which is true. Someone said it was the biggest Anzac Day gathering in our neighbourhood since the end of World War II. Nothing gets people together like a war and the end of a war. There is a video I saw once of a man dancing in the streets of Sydney the day the war ended. He takes his hat in his hand and dances down George Street, just like that. Fred Astaire in all his glory never looked so good. Now we have changed clothes, my friends and I, and filled our water bottles, and gone out to salute the cold glad morning on our bicycles. There is no better way to make the most of a morning. It is a national holiday. I do not know if a military day of remembrance can truly be holy, I have my doubts, but if anything can sacralise a day it is three hours in the saddle of a gliding, swooping bicycle. With our wheels close, almost touching, we ride as fast as we can until it hurts, and then we ride faster. We ride in the joy of the day, me and two friends, a German and an Austrian. I warn them that I do not want to hear any German-speaking today, that would be unheimlich and quite unacceptable. But really, what are a couple of world wars between friends on bicycles? On the way home we go to see a hockey game. My friend’s son is playing. He is a tall boy and he plays well, a good defender, and we cheer for him. When the clock is down to two minutes, one–nil, he turns and looks and sees his father. All day long I keep thinking about it, the way he turned, the way he saw his father. Storm Boy is previewing at the theatre on Sydney Harbour. It is the story of a boy named Storm Boy who lives with his father in a shack on a beach in South Australia. After a bad storm the boy nurses three baby pelicans back to health and one of them, a very fine pelican named Mr Percival, becomes his friend. In a storm at sea Mr Percival saves three sailors from shipwreck, and after that some hunters shoot him down. Because he was such a clever pelican, the sailors want to have him stuffed and put in the museum with a plaque describing how the pelican and the boy saved three men from a shipwreck. But the boy knows that Mr Percival does not belong behind cold glass in a museum, he belongs with the wind and the sea. So the boy and his father bury Mr Percival in the sand beneath the wooden post near the shack. It is a good play, my children love it and I love it even more. 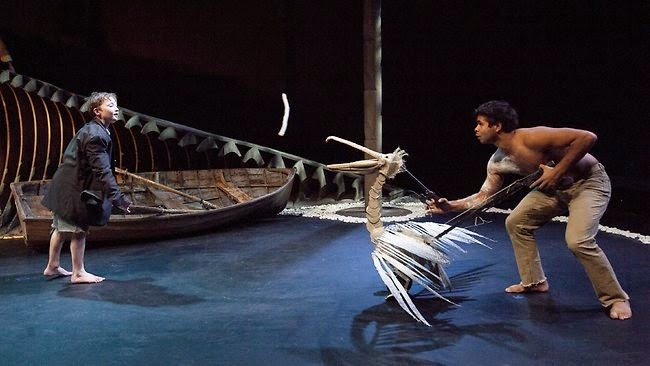 The pelicans are brought to life by puppeteers who make them waddle around the stage and snap their beaks at fish and spread their wings in flight and die in the arms of a boy. One of our friends was in the play so afterwards he takes my children backstage and shows them the puppets. Outside a heap of clouds is gathering, another storm, just like the one in Storm Boy. We walk out on the pier and watch the lightning flashing. We wait until we feel the first drops of rain and then we hurry to the car. There is laundry on the clothesline at home and we debate about whether we will make it back in time to get the clothes inside. As always I am optimistic; as usual my optimism is unfounded. By the time we get home the rain has swept the streets clean and all the clothes are dripping on the line. We got the rain but other parts of the city were struck by heavy hail, as heavy as the hail that fell on the Egyptians. In the pictures on the news the hail looks like snow on the ground. We are disappointed that we got no hail from the storm. We feel that we have missed the best part. Since the beginning of this year four people whom I know have died. This morning we marked the deaths of many thousands. I mean no disrespect to their memories when I say that I cried the most for Mr Percival and felt his death the most acutely, the death of a gentle pelican, a puppet on a stage.